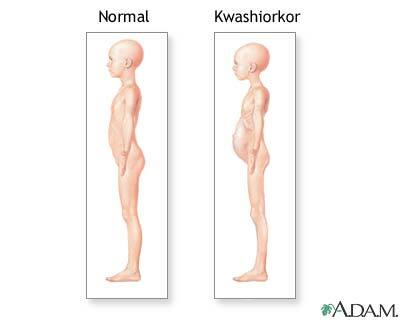 Kwashiorkor is a condition resulting from inadequate protein intake. Early symptoms include fatigue, irritability, and lethargy. As protein deprivation continues, one sees growth failure, loss of muscle mass, generalized swelling (edema), and decreased immunity. A large, protuberant belly is common. The incidence of kwashiorkor in children in the United States is extremely small and it is typically found in countries where there is drought and famine.